Tired of flying South, this gorgeous mosaic birdie artwork is looking for a home. Your space, which deserves a splash of hues, is exactly what he needs! 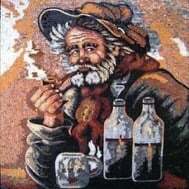 PROs: Handmade mosaic artwork composed of high-end marble tiles that is guaranteed to elevate your space. Mosaicist: Mo AR. CONs: May inspire you to book a flight to the South.